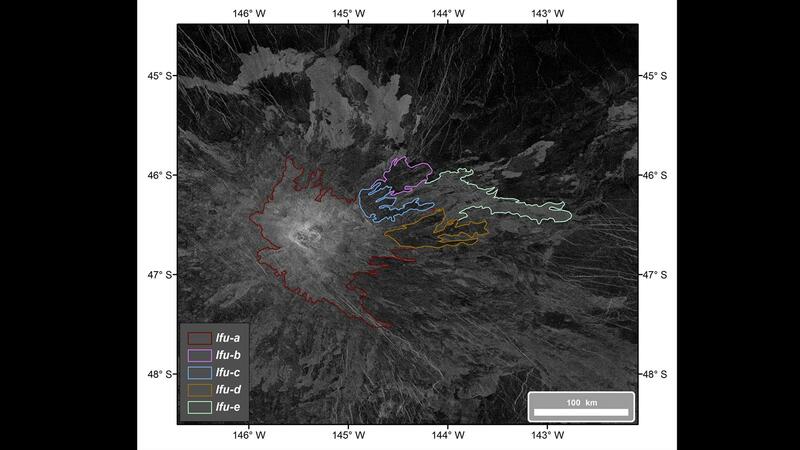 The figure displays an elevation model of Idunn Mons (46 S; 146 W), a volcano with a diameter of 200 kilometre located at Imdr Regio on Venus. The figure displays an elevation model of Idunn Mons (46S; 146 W), overlain on VIRTIS emissivity anomaly. In red, the areas characterised by recent volcanic activity. Geologic map of the eastern flank of Idunn Mons (46 S; 146 W), displaying the five lava flow units (lfu) identified during the mapping process. Lfu are classified from a to e. Lfu-a represents the summit composite unit of Idunn Mons, while the lfu-b, lfu-c, lfu-d and lfu-e are flank units of the volcanic edifice. The European Space Agency's (ESA) Venus Express mission has provided a great amount of data from the surface and atmosphere of Earth's inner twin planet. Among these observations was the mapping of the southern hemisphere of Venus in the near infrared spectral range using the VIRTIS (Visible and InfraRed Thermal Imaging Spectrometer) instrument. However, the thick and permanent cloud cover of Venus limits the achievable resolution, similar to observing a scene through fog. Using a numerical model, planetary researchers at the German Aerospace Center (Deutsches Zentrum für Luft- und Raumfahrt; DLR) pushed the limits of the data resolution. 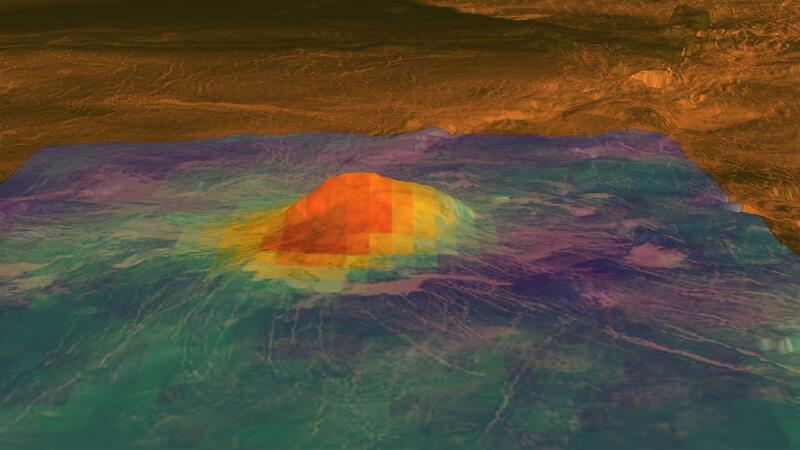 With this new technique, the emissivity anomalies were analysed on the top and eastern flank of Idunn Mons, a volcano with a diameter of 200 kilometres at its base situated in the southern hemisphere of Venus. These anomalies provide an indication of geologically recent volcanism in this area. "We could identify and map distinctive lava flows from the top and eastern flank of the volcano, which might have been recently active in terms of geologic time," says Piero D'Incecco, the DLR planetary researcher who presented these results at the joint 48th meeting of the American Astronomical Society's Division for Planetary Sciences (DPS) and 11th European Planetary Science Congress in Pasadena, California. "With our new technique we could combine the infrared data with much higher-resolution radar images from the NASA Magellan mission, having been in orbit about Venus from 1990 until 1992. It is the first time that - combining the datasets from two different missions - we can perform a high resolution geologic mapping of a recently active volcanic structure from the surface of a planet other than Earth." This study will also provide motivation for future projects focused on the exploration of Venus, as for example the NASA Discovery VERITAS mission proposal or the ESA EnVision M5 mission proposal that - in combining high-resolution radar and near-infrared mapping - will extend the frontiers of our current knowledge of the geology of Venus. From 2006 until 2014 the ESA Venus Express probe analysed the atmosphere and surface of Earth's twin planet. 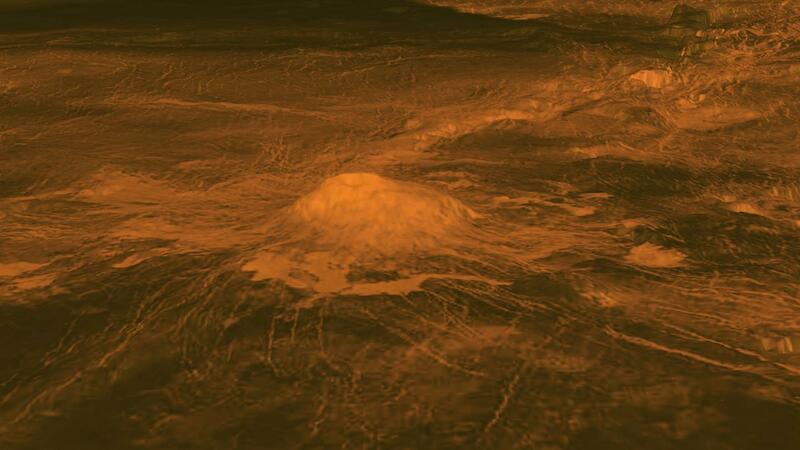 VIRTIS has provided data that indicates the occurrence of recent volcanic activity on Venus. DLR scientists Piero D'Incecco, Nils Müller, Jörn Helbert and Mario D'Amore selected the eastern flank of Idunn Mons - Imdr Regio's single large volcano - as the study area, since it was identified in VIRTIS data as one of the regions with relatively high values of thermal emissivity at one micron wavelength.